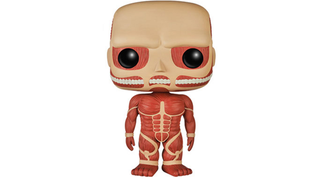 There's something about the Colossal Titan that means regardless of the form it comes in, it's always weird looking. I mean, it is a giant skinless monstrosity that chomps on the last of humanity, but it's an impressive feat that it still manages to get the creep factor in. Just look at that tiny, hulking body! The figures are due to arrive later this month, and will keep coming until the untold legions of Pop! Vinyls consume the Earth.